It had been hinted about around the local media here in New Zealand for the last few days, but now its official. 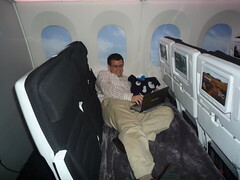 If you fly in coach on Air New Zealand, you’ll be able to lie down, well, some of you will. I was at the big reveal of the new interior yesterday, and I liked what I saw. All three cabins are getting a makeover, though the business cabin is a much more minor change than the rest. The process has taken them more than 3 years, and they hired famed design firm IDEO to work with them along with several local structural design firms. (Read more about the process on BNET.) The result is what CEO Rob Fyfe required – a new, superior product that takes up no more space than the old product and costs the traveler the same amount for a seat. They’ve done just that in coach. They’ve been saying this product is revolutionary; is it? To some extent, yes. Clearly the business class isn’t revolutionary, but the other two cabins are quite innovative to say the least. I guess the best way to answer this is . . . are there any other economy cabins in the world that allow you to lie down? Unless you’re on an empty flight, the answer is no. Here’s what they’re doing.